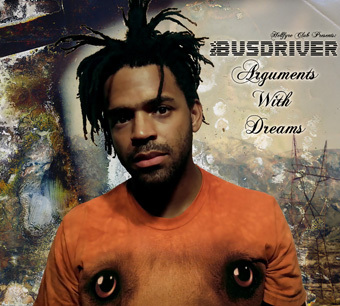 Busdriver is a rapper with plenty of lyrical skill and stamina, but his eclectic flows and abstract lyrics still make him more of an acquired taste to some people. I wasn't a fan of his last full length Beaus$Eros but this latest release is definitely more digestible - so don't let my hesitation stop you from checking him out. For those that are unfamiliar with this west coast MC think of Kool Keith's eccentric style mixed with Twista's rapid-fire mastery of rhythm and you may get an idea of what Bus sounds like. Busdriver has always been weird but lately his releases have been getting more and more left field, injecting skittering drums, video game synths, IDM beats and building a sound that is all his own in the process.